The first episode of Moshidora (What if a female manager of a high school baseball team read Drucker’s Management?) has aired. This is the last of my three most highly anticipated shows of the Spring 2011 season. In this post, I comment mostly on structural elements as revealed by the first episode. This series looks to be coming at an accelerated pace. If the subbers keep up, I will attempt to do the same. Yuuki and Minami. A major plus: very solid voice actor selection. First of all, Moshidora has some excellent seiyuu in key roles. 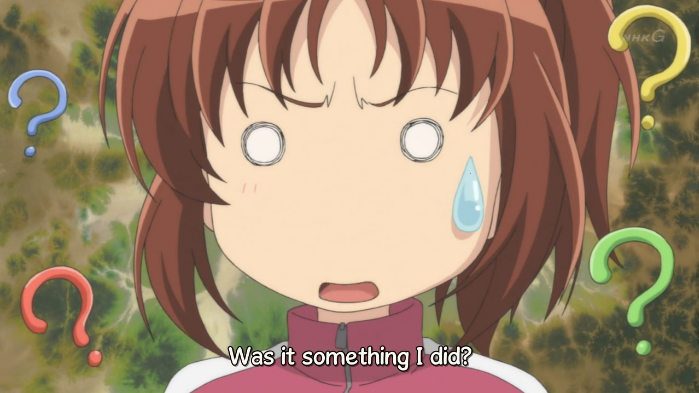 The main character, Minami, is played by Youko Hikasa, who is beloved by many as Mio in K-On, although this character’s determination (“pluck” or resolution) is more reminiscent of her work as Maya in Occult Academy. Minami takes on the role of manager for her high school’s baseball team as a favor to her friend Yuuki, who is the classic sickly girl, stuck in a hospital and wishing for a more active life. Yuuki is played by Kana Hanazawa, who has played these soft-spoken character types before, including Tenshi in Angel Beats, Anri in Durarara, and Susukihotaru in Otome Youkai Zakuro, to name just a few. Moshidora's art work excels in the deep background. You might see criticism of Moshidora‘s animation, so I want to clarify something. First, let’s distinguish between “art work” and “animation”. I try to always use “animation” (in this post and others) to mean the process of rendering motion in an anime. This is a very, very different concept than “art work”, or the term I sometimes use, “visuals”. By “art work” I generally mean the rendering of visuals on a 2D plane. 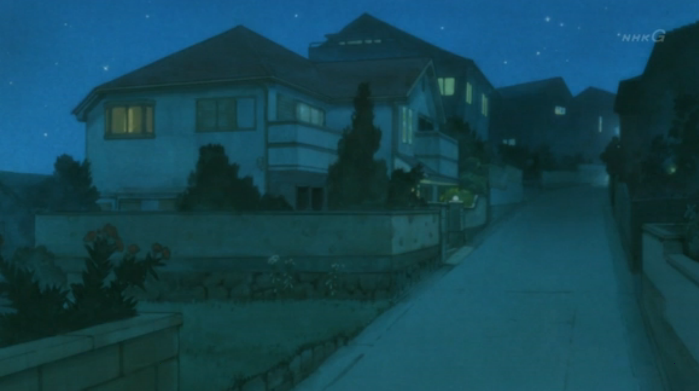 That is, “art work” can look GREAT, but still be lousy “animation”, because it is very static. 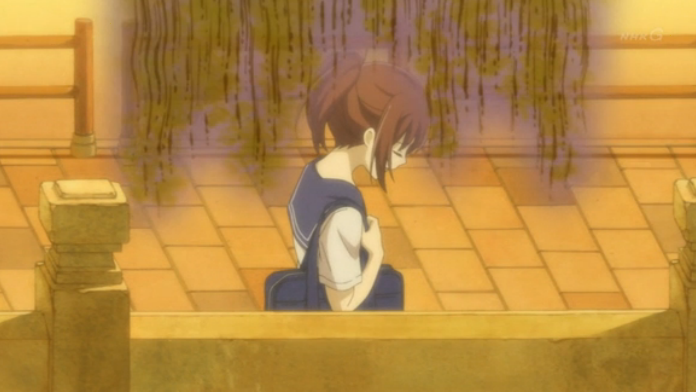 Psgels, who is truly a god amongst ani-bloggers, clearly understands this distinction, and calls out Moshidora for poor “animation” quality in his review, when he says, “there are a lot of still frames all around.” In other words, you will NOT see the dynamic, fluid motion that is one of the strengths of HanaSaku Iroha. This might seem strange, coming from animation company Production I.G., BUT it is not the same as saying the show “looks bad”. There is actually quite a lot of VERY nice “art work”, especially in the depictions of settings, and in particular, the deep background, such as scenes showing buildings, like the one above. It is just that this art work is mostly static, not showing action in motion. Occasionally an action scene is suggested with a still frame; there is no motion (“animation”), but the compositions are dynamic, and show a snapshot of frozen action. Further, the animation budget looked like it was used correctly, that is mostly on our first glimpse of Hodokubo High’s baseball team in action. In short, although this series clearly will not win the most amazing “animation” award, that is not the same as saying that it is so ugly it will hurt to watch it. Our hero has a touch of bi-polar disorder. It is early to say much about the characters. The only one we get to spend a lot of time with is Minami. I really liked her. As I said above, she has “pluck”. In other words, she has the determination to succeed, against all odds. Despite hating baseball (for an as yet unknown reason), she is willing to do what it takes to help the team get to Koshien Stadium. She also has profound negative emotions. I’m looking forward to seeing her succeed. I also liked the guy who I assume is the coach; he has a cool attitude and quotes Cicero. 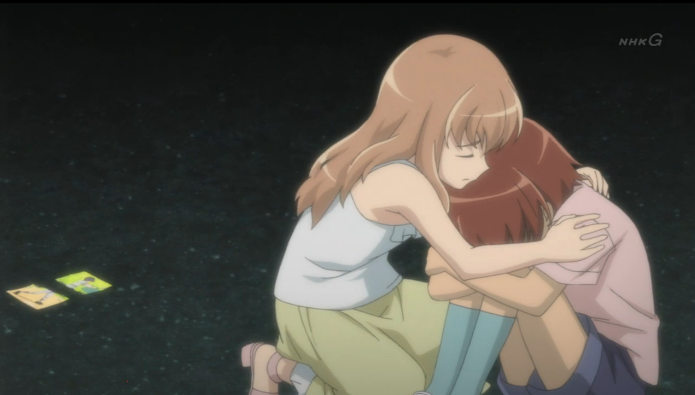 Aside from Yuuki, Minami’s hospitalized friend, only a couple of other characters have been introduced, and most of that was to show their flaws, as the team loses an important game. 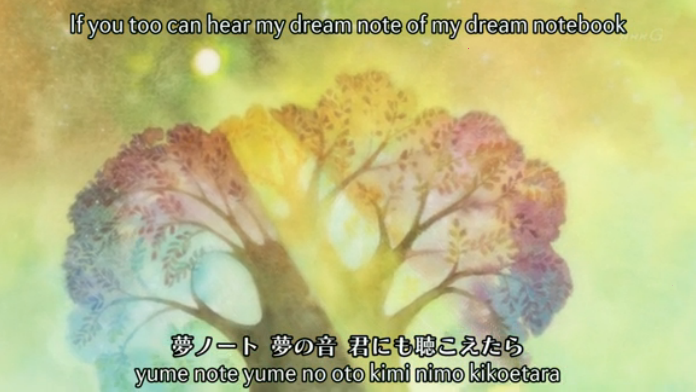 The OP includes some interesting dreamy watercolor work, but is mostly character-based. It is also too early to say much about the BGM, although I enjoyed the short piece over the title that sounded like something you would hear while playing with a Wii. The OP and the ED are both ballad-like and somewhat nostalgic; those songs might have been chosen to appeal to older viewers, but I wasn’t really impressed (with the exception of that picture of a tree, above — Production I.G. should do a whole show in that art style!). Star Crossed Anime. This is the review by Psgels linked to above. A qualified like. Tenka Seiha. Aroduc claims this show is so bad that he wishes he was never born. Chocolate Syrupy Waffles. Megan Fox Meggido seems to like Moshidora even more than I do. Dude, the guy’s name is meggido! Megan Fox was an April Fools name!